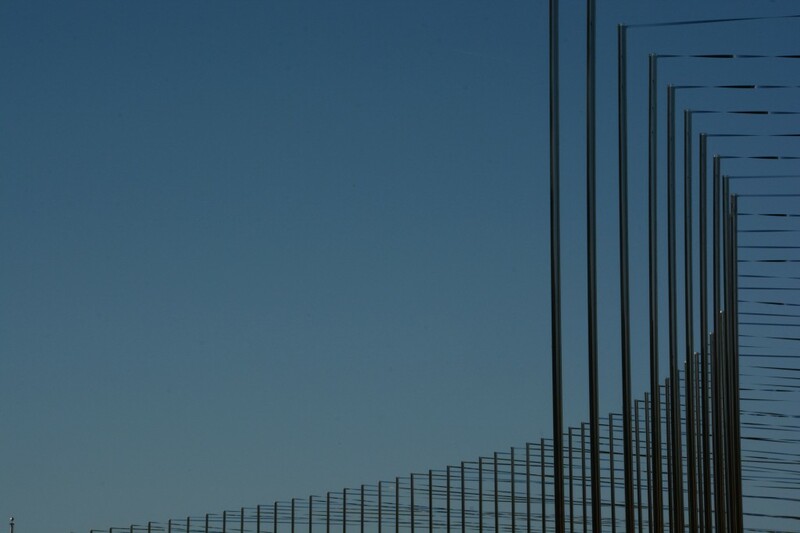 Scarecrow was a site-specific installation by artist Žilvinas Kempinas and the largest installation in Socrates’ 28-year history. 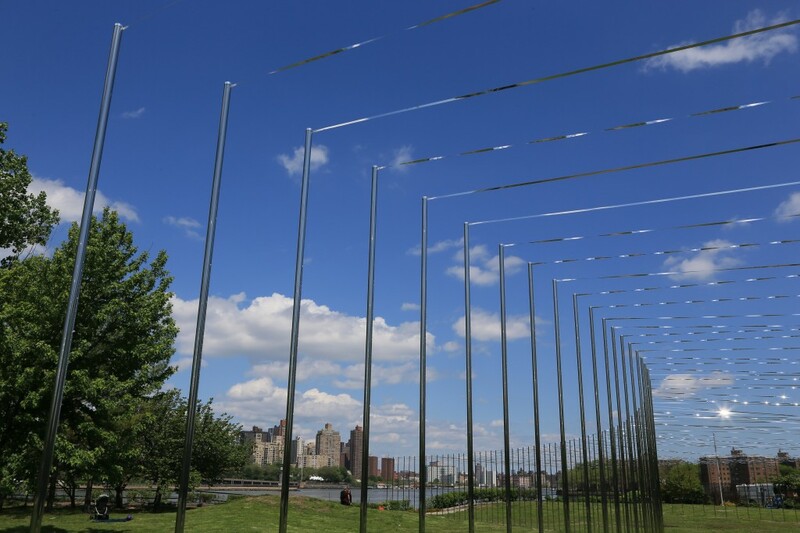 Minimal and magical, the sculpture was a 250-foot-long, thirteen-foot-high kinetic pathway composed of 200 stainless steel, mirrored poles connecting energetic slopes of silver Mylar ribbon overhead. With two simple elements – poles and tape – Scarecrow activated the invisible forces of nature. Scarecrow reflected its surrounding environment and thus continuously changed throughout the exhibition. 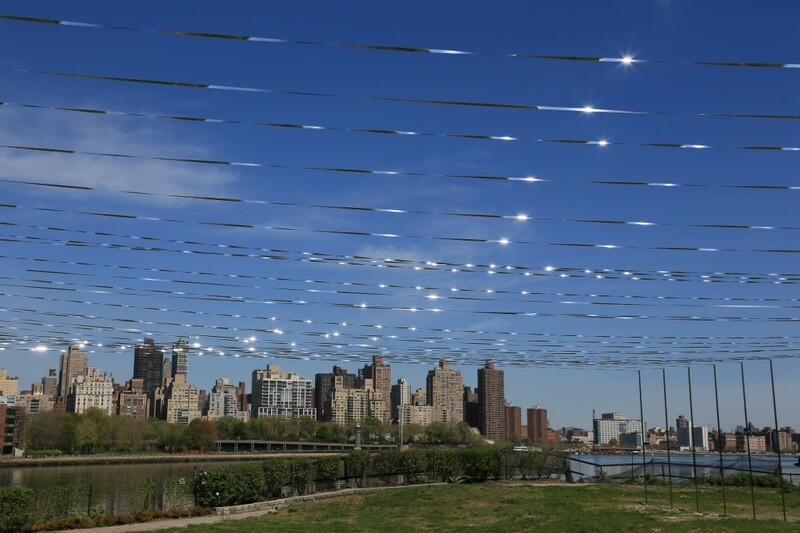 The perpetual motion of the ribbon, as it responded to the wind of its environment, echoed the natural flowing of the nearby East River, while the mirrored material reflected momentary shifts of light and sky like a shimmering horizon along the waterfront. 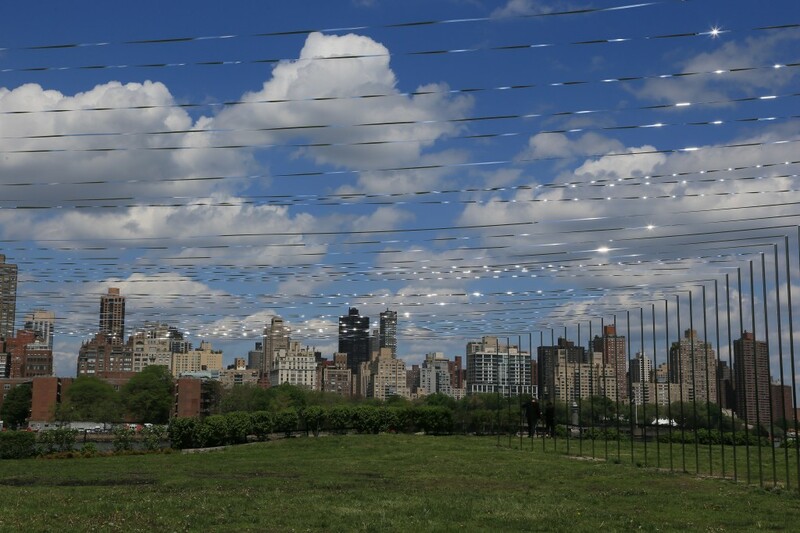 Blanketing a large portion of the 4.7 acre park, Scarecrow was Kempinas’ first major outdoor installation in the United States. 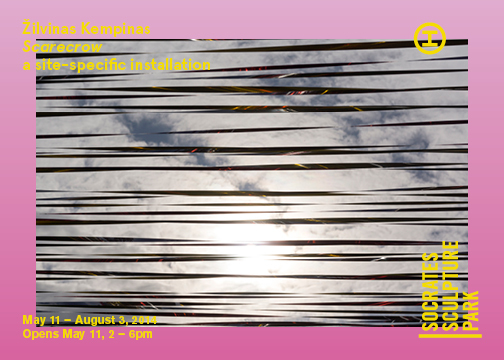 Kempinas is internationally acclaimed for his kinetic installations and controlled, minimalist works; notably, the artist represented Lithuania at the 2009 Venice Biennale with a site-specific installation entitled Tube, and more recently Double O at the Museum of Modern Art, New York (2010), and Slow Motion at Museum Tinguely, Switzerland (2013). 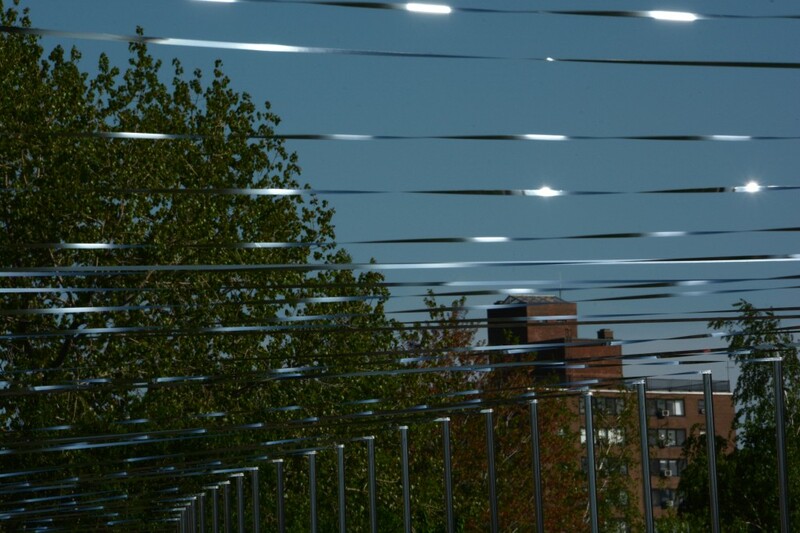 Kempinas recently created his first outdoor sculpture for the Echigo Tsumari Art Field In Japan (2012), which was subsequently shown as part of his solo exhibition at Museum Tinguely. That work, made from Japanese snow-measuring posts and bird-repellant ribbons, was titled Kakashi – or “Scarecrow” in Japanese. At Socrates Sculpture Park, the artist’s latest Scarecrow expanded on Kakashi in scale, shape, and setting. 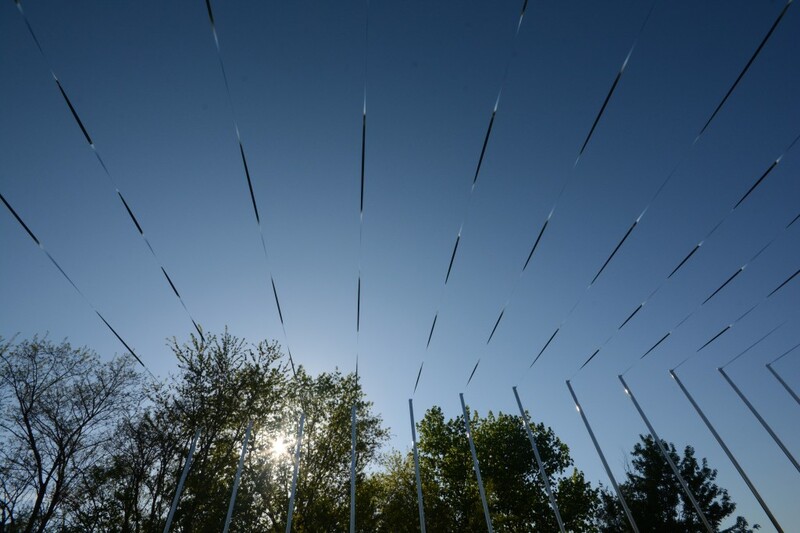 Unlike his large-scale installations in museums, galleries, and biennials, where the artist carefully calculates and manipulates artificial elements to create a desired effect, Kempinas’s outdoor sculptures are experimental and adapt to fluctuating weather conditions. While this fluidity creates endless possibilities for effect, the artist maintains a meticulousness in his process, establishing a series of set conditions upon which nature can play. From a distance Scarecrow appeared as a monumental single sculpture that was at once impressively precise and brutally horizontal. 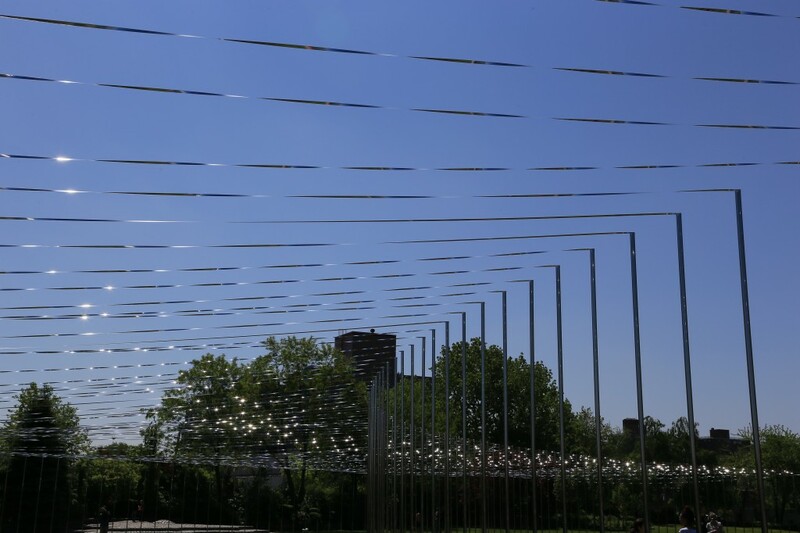 As you moved closer to the installation, however, Scarecrow became enlivened with motion and sound as it captured the wind and pulled the surrounding landscape into itself. Scarecrow was made possible, in part, by generous gifts from the Lewben Art Foundation and Martin Z. Margulies. 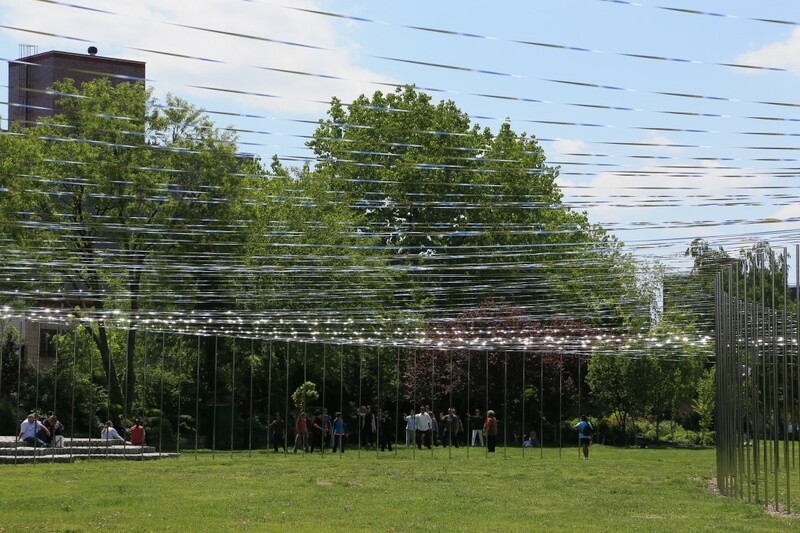 The 2014 Exhibition Program at Socrates Sculpture Park was made possible by major support from the following: Bloomberg Philanthropies, Charina Endowment Fund, Cowles Charitable Trust, Mark di Suvero, the Sidney E. Frank Foundation, the Maxine and Stuart Frankel Foundation, Agnes Gund, Graham Foundation for Advanced Studies in the Fine Arts, Lambent Foundation, Ivana Mestrovic, Plant Specialists, Shelley and Donald Rubin, and the Thomas W. Smith Foundation. 2014 Exhibitions were also supported, in part, by public funds from the New York State Council on the Arts, a state agency, and by public funds from the City of New York Department of Cultural Affairs in partnership with the City Council.